What hardware is used in your Mac setup? I’m sure others will be curious how to set up a similar configuration, so here are some additional details on the four-panel display setup and how it all ties together. 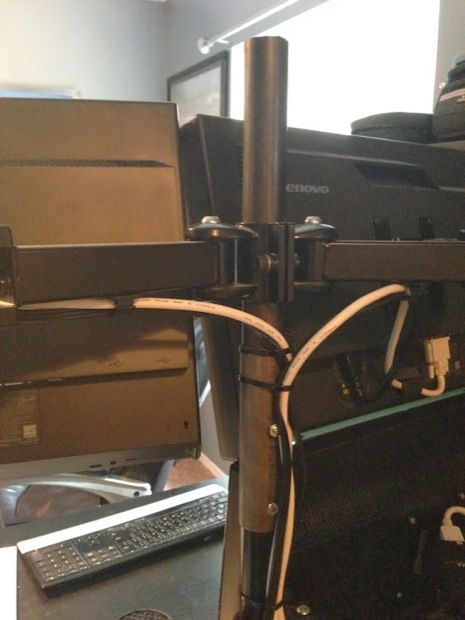 Using the stand I got from Amazon as a base, I used a matching diameter piece of pipe and a sleeve pipe with the same inside diameter to effectively make the stand taller to better accommodate the top row of monitors (both the Lenovos are along the top row). The stand is easily strong enough to handle the additional weight, plus I added some rectangular pieces of aluminum where the base clamps to my IKEA desk for some extra strength. One of the Mac’s ThunderBolt outputs goes to the HP monitor via a Mini DisplayPort to DVI adapter , that monitor runs at full resolution. 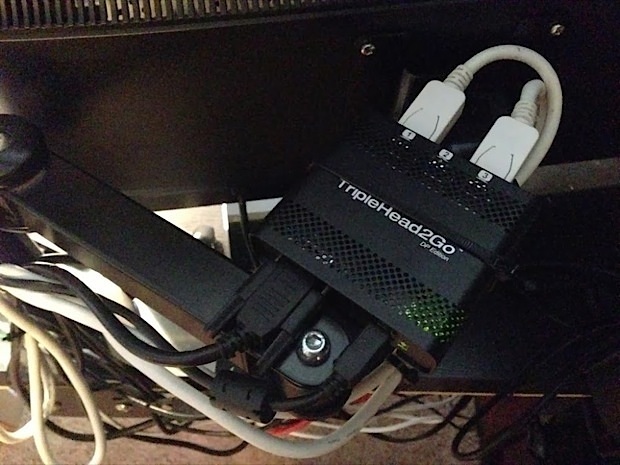 The other ThunderBolt output goes into the StarTech Thunderbolt Dock , with the Matrox TripleHead2Go getting signal from the Thunderbolt pass through, as well as power from one the StarTech dock USB ports. The Matrox presents both Lenovo monitors as one big 3840×1200 resolution monitor to the MacBook Pro, this allows me to run all three monitors while making the MacBook Pro only think it is running two displays. The StarTech Dock gives me wired network access, handles sound output to my speakers, powers my Toshiba USB hard drive (used for SuperDuper, Time Machine, and extra storage)… Thunderbolt rocks ! The left side USB port on my MacBook Pro is hooked to a powered Belkin 7 port USB hub that holds the dongle for the Logitech keyboard. It also powers the Connectland laptop cooling stand and gives me easy access to hook up a Lightning cable for my iPhone and iPad. What do you use this great Mac setup for? I am Web Programmer by trade and needed a lot of real estate and CPU power to have my programming tools open as well as different browsers for cross-browser testing. The setup is also used for others work things like Instant Message, Email, and Google+. What are some of your favorite Mac apps? Parallels Desktop 9 : This is a must have since I do a lot of SQL Server coding and managing, as well as coding in Visual Studio. Parallels has done a fantastic job, it is stable and “just works”. Rogue Amoeba Airfoil: AirFoil allows me to shoot any audio from my MacBook to anywhere in the house. It was nice the other night when we threw a party and I had Spotify running here from the desk but the music was playing in the living room, garage, and our outside speaker setup all at once. Do you have any tips or suggestions you want to share? If you feel that you are putting any kind of strain on your system, then please buy a decent cooling stand setup, it will be such a long term life saver of your treasured laptop. With the cooling stand I have, I keep my overall temps around 120 degrees F° (according to iStat, another great use for that app) with everything up and running that comprises my usual work day. On the Mac, you can save yourself time by investing in a decent text expander program like “aText”, it’s such a time saver to be able to wire in a simple phrase to spit out a huge chunk of code or text. I bet I save 5-10 minutes a day of typing because of this excellent program. Got an great Apple or Mac setup you want to share with OSXDaily? Take a few good pictures and answer a few questions, and send them in! Is there any lag or slowdown running 3 screens like that? I didn’t know the MacBook Pro Retina video card was that powerful, but this is a really impressive config if there’s no performance hit. I am not sure about your situation, but most of us need a job to be able to sustain ourselves due to the financial expectations of living in a modern society. So, selling your workstation is not really a viable option, and instead investing in your workstation to make it as productive as possible is the best we can all do. Nice setup. 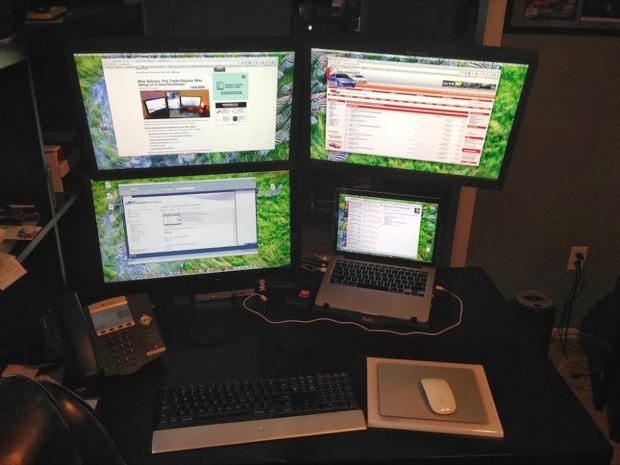 I currently run a Linux desktop with dual displays and use synergy to control a macbook with an external display – giving me 4 desktops. Are there any other viable solutions that are cheaper? Also I echo the previous comment and Q – how is this for performance? Whenever I hear programmer as someone’s title, I cringe. You program your alarm clock, you develop a site. 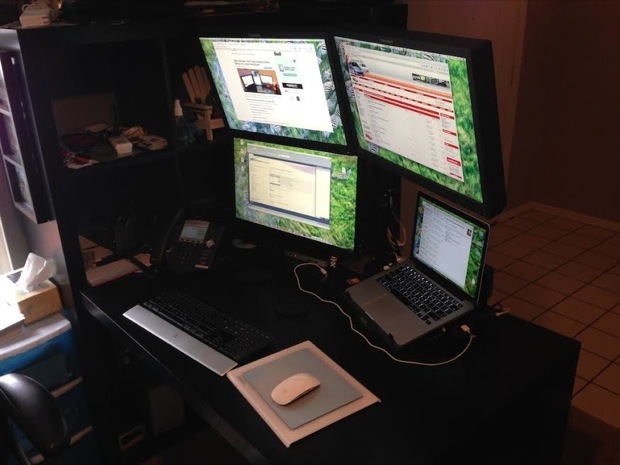 Also, four screens doesn’t make you any more productive or a better programmer. Just buy a 39″ Seiki 4K TV for $499,- and you have 4 HD screens in one. Works brilliantly with my 15″ rMBP. can you expand on this? how is this a 4 screen setup? Hey man this looks like an awesome setup. I am a web and ios programmer and I own Mac products as well. I am currently in the market for a new laptop probably the MacBook Pro retina late 2013 with the graphics card. I noticed that your only using the MacBook Pro 13 retina late 2013 with iris. Does this result in any frame drops when doing work on those extra monitors? I am asking this because I on,y wanted to get the 15 inch with the graphics card so it can handle all my external monitors. Hey everyone, thanks for the nice comments. This is pretty cool, as a fellow dev, I can respect the need for more screen real estate. I keep thinking about doing something similar, but I find myself working in remote locations a lot, so having an amazing setup like this at home reminds me of those guys who buy amazing cars just to leave them in the garage. For me, I need a way to have that much screen real estate while sitting at a Starbucks or Panera. 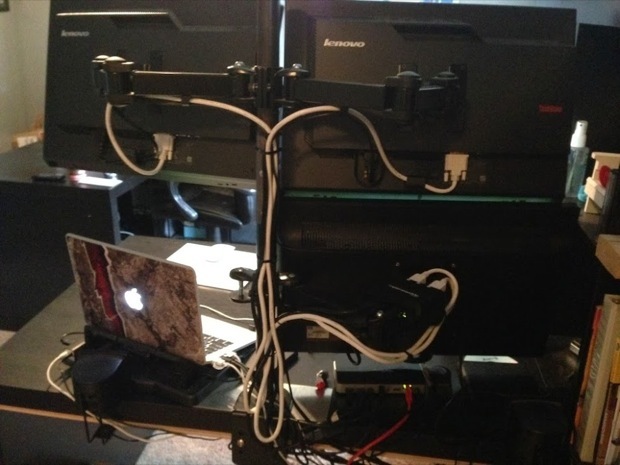 You can do this without the matrox with the 15 inch MacBook Pro retina. I run 3 monitors + the built in LCD. 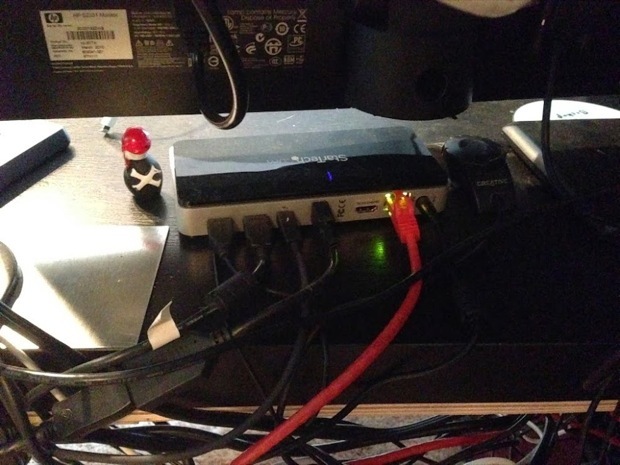 I connect monitors to each of the thunderbolt ports and the hdmi port. I don’t think the gpu of the 13 can handle more than 3 displays. I have seen complaints that making a window full screen will span all the available displays instead of maximising in just that window. Is that true? Could you post the model and branch of the mousepad that appears in the photo? Is it comfortable besides precise? 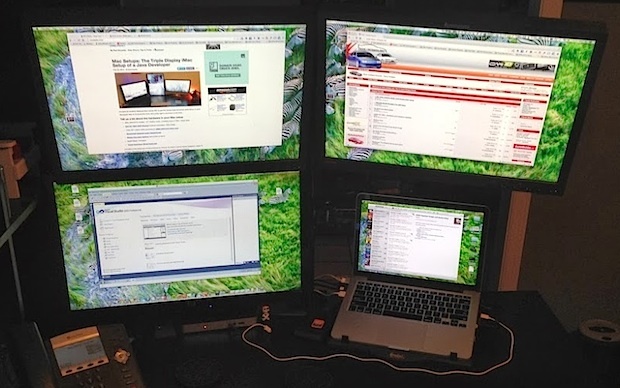 Noob Q: how would one run 3 monitors with the current macbook air? i.e., all 3 monitors are consider one display.